All purchases are managed by Google Play Billing, and may be cancelled and refunded at any time. 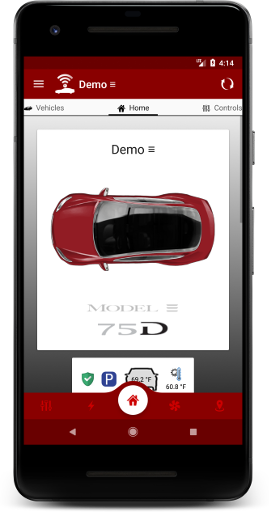 Dashboard for Tesla is the premier alternative to the official Tesla Motors app on Android. You deserve an app as luxurious as the car you drive, something the official app has failed to provide and what this app aims to deliver. There is immense potential for your Tesla right here waiting for you to unlock it. 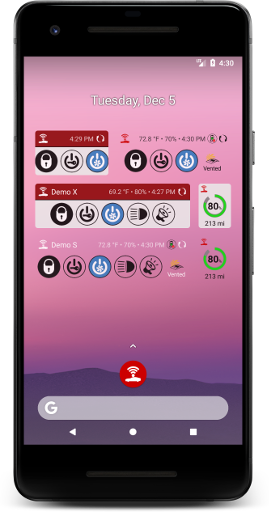 Purchase access and you can control your Tesla remotely from anywhere with exclusive features and around-the-clock support. Try out the app for free using the demo mode, or sign in and take part in our Free 1-Week Full Access Promotion! Samsung Gear Support ...in the works! If you'd like to feature the app, contact us to be added to the list. Your sensitive information is of our utmost concern and has been catered to from the very beginning. 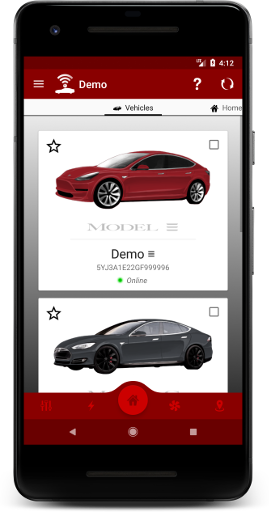 Dashboard for Tesla stores some of your data locally using shared preferences encrypted with 256-bit AES. Dashboard for Tesla sends all network traffic over HTTPS sending some of your data to the following web services in order to function properly. 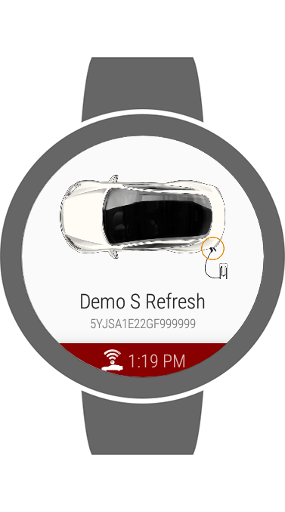 Monitor and control your Tesla from your Android Wear devices with complete Android Wear support for all vehicle commands and data, including Summon, all available to you right from your watch. You may have any number of Wear devices paired with any number of Tesla accounts and vehicles. Requires the companion app to be installed on your device. 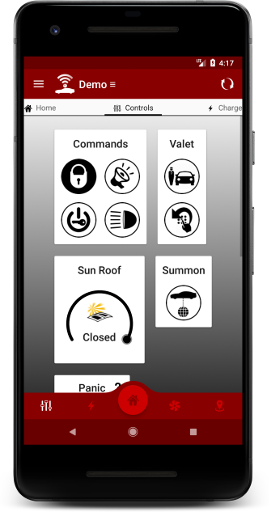 An invaluable feature included with all access types that offers you quick and immediate access to the most useful vehicle controls and information right from your home screen. All widgets are configurable to better suit your home screen. Widgets also offer different functionality and information depending on the type and size. You may have any number of widgets paired with any number of Teslas. 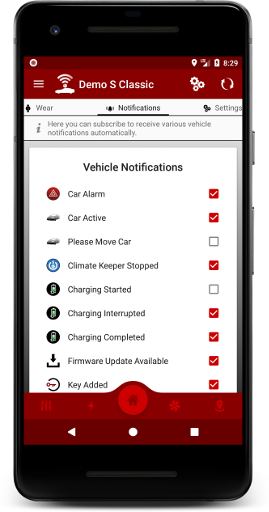 A great feature for you to rest easy no matter where ever you are knowing if anything should happen to your vehicle that you will automatically be notified. A must-have for snoozing in your Tesla. You can now keep the HVAC running indefinitely with the car off. Ordinarily, your Tesla will automatically shut off its HVAC system after 30 minutes if the car is off. This is to protect your battery from draining to empty if you should forget to turn the HVAC off remotely. However if you plan to spend the night in your Tesla, you may want to keep the HVAC system running all night. 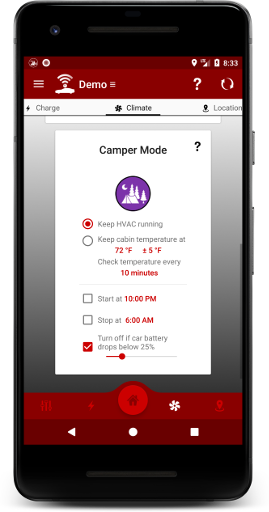 With Camper Mode, you can do just this with peace of mind your battery charge is safe by configuring it to automatically turn off camper mode when the car's battery drops below a set percent, or turn it on and off at a particular time. This feature works by automatically ensuring the HVAC system is on every 15 or so minutes. As long as your device and Tesla maintain internet connectivity, feel free to close the app, or sleep your device and Camper Mode will still function while respecting your device's battery waking it up as little as possible. Requires your device to stay powered on, and requires both your Tesla and your device to maintain internet connection. A great feature for those in uncomfortable weather. 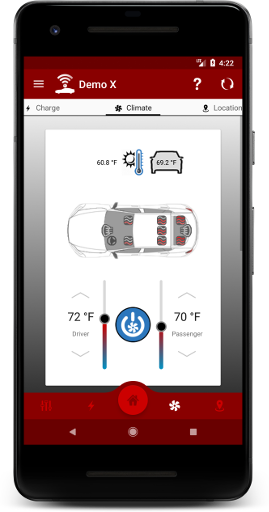 You can now protect the cabin temperature of your Tesla from reaching extreme temperatures around the clock. 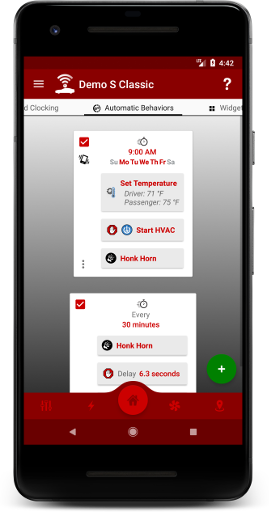 This feature works by periodically monitoring the status of your vehicle, automatically starting, stopping, and adjusting the HVAC system to keep your cabin temperature within your desired range. We all do it more than we care to admit... forget to plug-in at the end of the day. 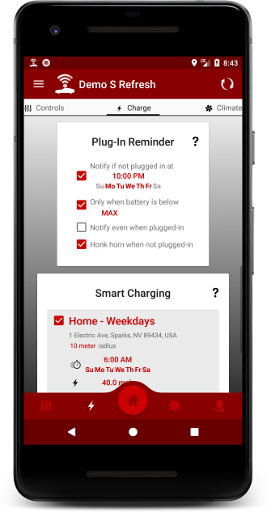 This exclusive feature looks to prevent that and give you peace of mind by reminding you if your Tesla is plugged-in at your desired time daily. An exclusive, one-of-a-kind feature for your Tesla. 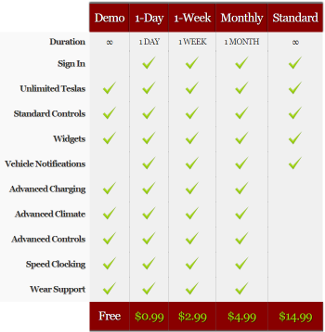 You can now have complete control over your charging schedule. 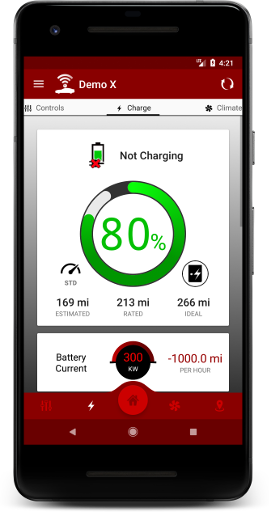 Smart Charging allows you configure charging locations such that charging will complete at your desired completion time, while optionally respecting your off-peak time restrictions. In other words, instead of scheduling when to charge, you schedule when charging should complete. 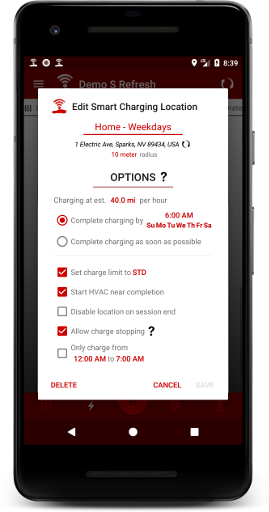 This just-in-time charge completion gives you a warm battery at departure, has the HVAC running for your departure, and can save you money by restricting charging to off-peak hours while ensuring your battery is as charged as possible by your completion time. Another exclusive, one-of-a-kind addition for your Tesla. 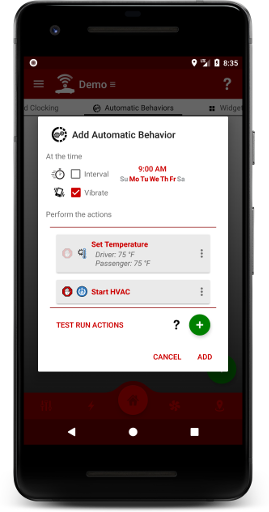 With this Advanced Controls feature, you can schedule vehicle commands to be sent automatically based on conditions you set for yourself. You can automatically do things like start the HVAC per your Monday-Friday work schedule, or start and stop charging exactly when you want, or close the sun roof, lock the car and set the charge limit every night, or honk the horn every 15 minutes to be annoying. An exclusive, one-of-a-kind feature for your Tesla. 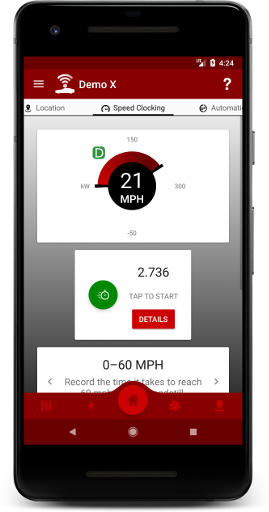 You can record, track, graph, analyze, and export raw data for your speed clock times for various scenarios: 0–30 mph, 0–60 mph, 0–100 mph, and ¼ mile. 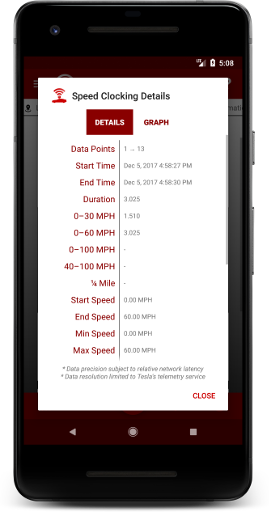 This feature works by using the already available speed and location telemetry data of your vehicle to track and calculate your times accurately. You may export all the raw telemetry data for your times to a CSV file for other uses. 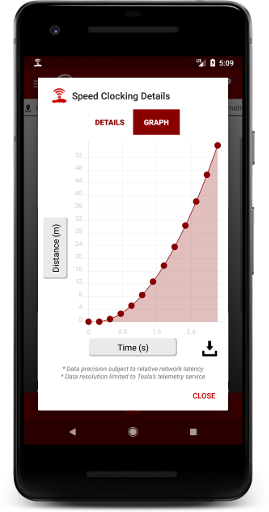 The analysis of your times and the respective data are presented with an interactive graph allowing you to dynamically plot each data component collected against one another - speed, distance, time, power, etc. 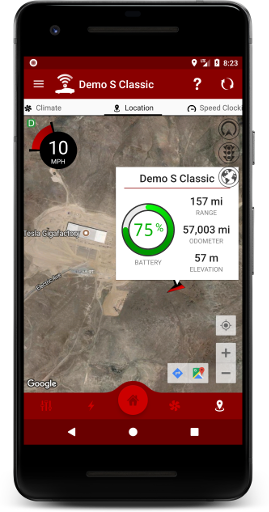 An exclusive feature included with all access types providing a trip tracking mechanism that you can find in the car, except it's done remotely on your device. This is especially useful in definitively determining if anyone has taken your Tesla for a joyride based off the mileage diference. 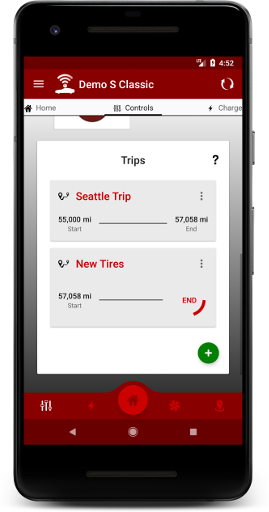 You can have any number of trips and you can view trip metrics at any time, this includes odometer readings, mileage driven, trip duration, etc. These trips have no connection to the trips configured within the car itself.